His 2016 debut recording ‘The Beast’ was named one of the top 3 Jazz releases by NPR, received a 4 star rating in DownBeat Magazine, and nominated for the prestigious French ‘Grand Prix du disque’ award for Album Of The Year 2016. 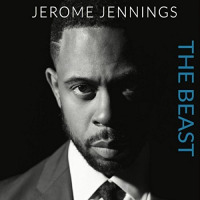 As a performer Jerome Jennings has played every major Jazz club in New York City from The Village Vanguard, Birdland, The BlueNote, to Dizzy’s Club Coca Cola. Jerome has performed in over 40 countries, and has recorded, and/or toured with Sonny Rollins, Hank Jones, The Count Basie Orchestra, Wynton Marsalis (J@LC), Dee Dee Bridgewater, Christian McBride, Hamiet Bluiett, Freddy Cole, Paula West, Ronnie Mathews, Ernestine Anderson, Benny Golson, Craig Handy, Davell Crawford, Houston Person, Mike “Philly” Phillips, Henry Butler, Slide Hampton, Mary Stallings, Gerald Wilson, Tim Reis, Bernard Fowler, Benny Powell, The Mingus Big Band, Curtis Fuller, Valery Ponomarev, among others. Jerome Jennings gives back by teaching, conducting clinics, and educational youth out reach in conjunction with Jazz At Lincoln Center’s Jazz for Young People (JFYP) program. He is also teen mentor, ensemble coach, and drum instructor for NJPAC (New Jersey Performing Arts Center). He is also an instructor, ensemble leader for Lincoln Centers JALCYO (Jazz At Lincoln Center Youth Orchestra) programs. He is drum instructor and ensemble leader for Jazz House Kids; a community arts organization in New Jersey exclusively dedicated to educating children through jazz: One of America’s home-grown art forms.